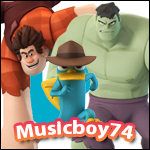 Disney Infinity Fans • View topic - [NOW PUBLIC] Disney Infinity Fans Steam group! [NOW PUBLIC] Disney Infinity Fans Steam group! 2) Play games and hangout with other DIF members! In order to keep it friendly like the forums itself, you will need to follow the site rules except the ones focused on the forums (ex. quoting, double posting, posting unnecessarily, etc.) So Play Nice! or you'll be removed from the group. Also, Steam groups have a class system: Owner, Officers, Moderators, & Members. If you're interested in being an Officer or Moderator, PM me!